Fleets across the UK are being urged to equip their drivers with special service kits enabling them to easily check tyre pressure, tread and condition as new figures highlight the potentially fatal risk of cars and commercial vehicles fitted with illegal tyres. Furthermore, according to the Driver and Vehicle Standards Agency, tyre defects are one of the major causes of MoT failure among cars and vans with available figures suggesting 2.2 million vehicles annually fall foul of checks due to tyre-related issues*. vGroup, the UK’s leading provider of motor accessory essentials, has already supplied more than 96,000 tyre service kits to fleets this year. 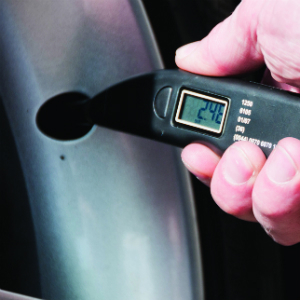 With the onset of winter driving conditions, and the increasing demands of improving carbon dioxide (CO2) emissions and fuel economy, the business believes it is even more critical that all company car and commercial vehicle fleets should check tyre condition regularly, and to make it easier equip drivers with tyre service kits as part of at-work driving safety policies and procedures. As the annual October National Tyre Safety Month draws to a close, TyreSafe, the not-for-profit organisation that promotes it, has calculated that more than 10 million tyres currently fitted to vehicles could be illegal**. What’s more, illegal, defective or under-inflated tyres are the single largest vehicle-related defect recorded by police officers as a contributory factor in road traffic collisions. The Department for Transport’s Reported Road Casualties Great Britain (RRCGB) 2015*** analysis reveals defective tyres were a contributory factor in crashes that resulted in 16 deaths, 146 people being seriously injured and 746 people slightly injured. Mr Nash, who earlier this year became director of Driver First Assist (DFA) – a non-profit making organisation that trains professional drivers to provide life-saving first aid and manage the scene at a road traffic collision, prior to the arrival of the emergency services – continued: “About 25% of crashes on UK roads involve at-work drivers. vGroup, which endorses Tyre Safety Month, has this year supplied Digital Tyre Service Kits to West Midlands-headquartered Monks & Crane Industry Group. HSEQ (health, safety, environment and quality) manager, Michelle Dalby, said: “Monks & Crane is constantly working on improvements, and vGroup assisted us to successfully launch tyre service kits to our drivers. Previously we requested drivers completed vehicle inspections that included tyre checks but we had not provided the drivers with any tools to do that effectively. What’s more, drivers were issued with digital rather than manual gauges to enable more accurate tyre pressure readings to be obtained. 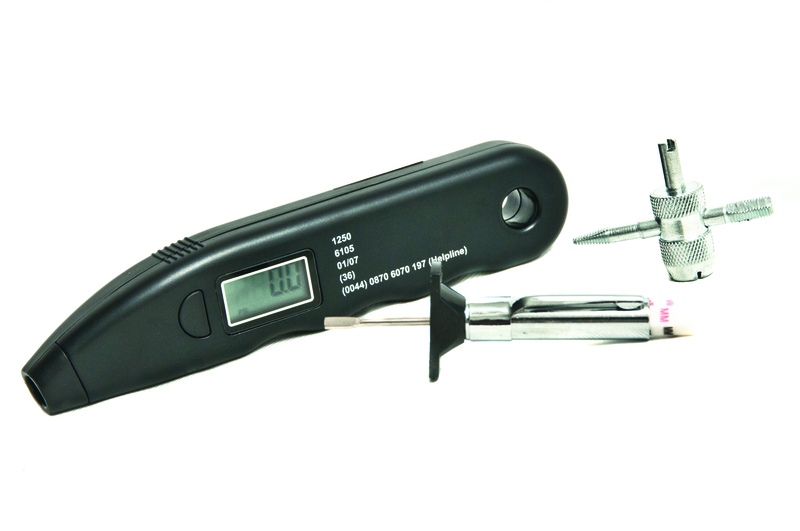 Digital Tyre Service Kit comprising a digital pressure gauge, tread depth gauge, a tyre valve tool enabling the threads to be cleared and for extracting valve cores and replacement tyre valve caps. Best practice dictates that tyre condition is checked at least monthly and prior to long journeys. Poor tyre care reduces road safety – the penalty for illegal tyres below a tread depth of 1.6mm is a fine of up to £2,500 and three penalty points per tyre – and incorrect tyre pressures impact on fuel economy and tyre wear.